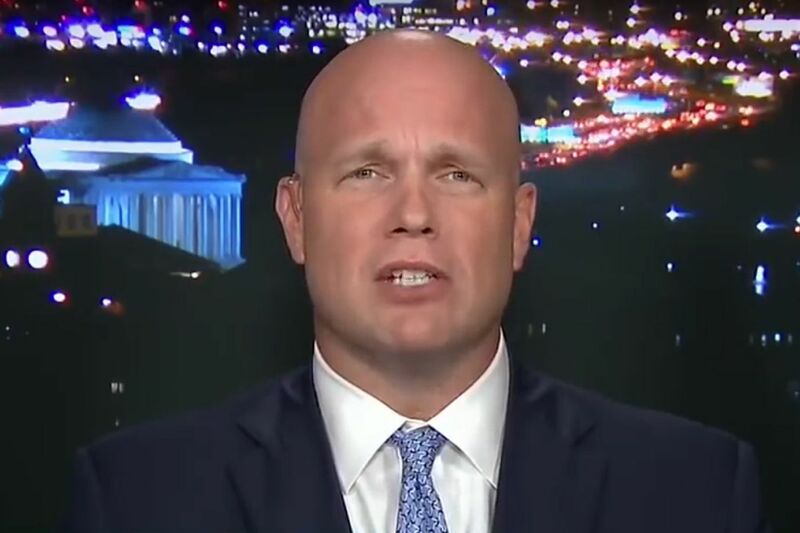 Matthew Whitaker, whom President Trump named acting attorney general, during an appearance on CNN in July 2017. Matthew Whitaker, whom President Trump named acting attorney general after forcing Jeff Sessions to resign Wednesday, has made it clear he's not a fan of special counsel Robert Mueller's investigation of Russian meddling in the 2016 election. Among his other duties, Whitaker, a former U.S. attorney who has served as Sessions' chief of staff since October 2017, will take over control of Mueller's investigation from deputy attorney general Rod Rosenstein. It was unclear Thursday whether Whitaker would take any actions that could impact Mueller. But prior to joining the Department of Justice, Whitaker was an outspoken critic on television and social media of Mueller's investigation. With Sessions out, what will happen to Rod Rosenstein? In August 2017, Whitaker promoted a column written by George Parry, a former state and federal prosecutor who's now a lawyer in Philadelphia. In the column, Parry urged then-White House lawyer Ty Cobb not to cooperate with Muller's investigation, calling it a "lynch mob." "Worth a read," Whitaker noted on Twitter. On the same day, Whitaker, who was a legal commentator on CNN from June to September 2017, wrote an opinion piece on CNN's website claiming Mueller's investigation into Trump had gone too far, and called on Rosenstein to "order Mueller to limit the scope of his investigation." During an appearance on the network a month earlier, Whitaker told CNN host Don Lemon that he could see a scenario in which Trump replaced Sessions with a recess appointment of an attorney general who "reduces [Mueller's] budget so low that his investigation grinds to almost a halt." Whitaker said reducing Muller's budget would be "a little more stage-crafty than the blunt instrument of firing the attorney general and trying to replace him." The New York Times reported that Whitaker first came to Trump's attention because the president enjoyed Whitaker's skepticism about Mueller's investigation during his appearances on CNN. "Whitaker's appointment raises blaring alarms about the acceleration of obstruction of justice and a fundamental attack on the rule of law in our country," Oregon Sen. Ron Wyden, a Democrat who serves on the Senate Intelligence Committee, said in a statement. "Congress must act right now to protect the special counsel's investigation." Fox News legal analyst Andrew Napolitano was also critical of Whitaker's appointment, arguing on Fox & Friends Thursday morning that Whitaker was "not legally qualified" to serve in the position because he isn't serving as deputy attorney general and doesn't hold a Senate-confirmed position. "With deference and respect to what the president is trying to do — he has every right to have whoever he wants to run the Justice Department," Napolitano said. "He has chosen someone who does not qualify under the law to be the acting attorney general of the United States." Whitaker, whose Twitter profile shows him lifting weights, played college football for the University of Iowa (and even scored a touchdown in the 1991 Rose Bowl) before earning his law degree. In 2004, he was appointed by former President George W. Bush to be United States attorney for the Southern District of Iowa, where he was ultimately replaced by former President Barack Obama in 2009. Whitaker was also a candidate in the Republican primary in 2014 for the open Senate seat in Iowa vacated by Democrat Tom Harkin. Whitaker finished fourth in the primary, which was won by Joni Ernst, who went on to win the general election. Another candidate who lost in that primary was Sam Clovis, a local radio show host who later became Trump's 2016 co-chairman. Clovis withdrew his name as Trump's nominee to be the Department of Agriculture's chief scientist in part because, during the campaign, he was aware of efforts by foreign policy adviser George Papadopoulos to broker a relationship between the campaign and Russian officials, according to the Washington Post. Whitaker served as Clovis' campaign chairman in 2014 when Clovis ran for state treasurer in Iowa. Clovis told Talking Points Memo that the two remain "very close friends."